NELSON Hospital Nagpur (NELSON Mother and Child Hospital), Nagpur published a new job notification for HR Head, Marketing Head, Nurses, Lab Technician, X-ray Technician, Maintenance Head, NABH Co-ordinator Posts. The recruitment is for total 17 Vacancies. The willing candidates are informed to see the latest notification January 2019. Qualification required GNM /B.Sc. Nursing/ BE/Diploma/MBA and More. For More details of NELSON Hospital Nagpur Recruitment 2019 Read Below. Education Qualification: GNM /B.Sc. Nursing/ BE/Diploma/MBA and More. For Post wise Education Details follow the detailed advertisement. 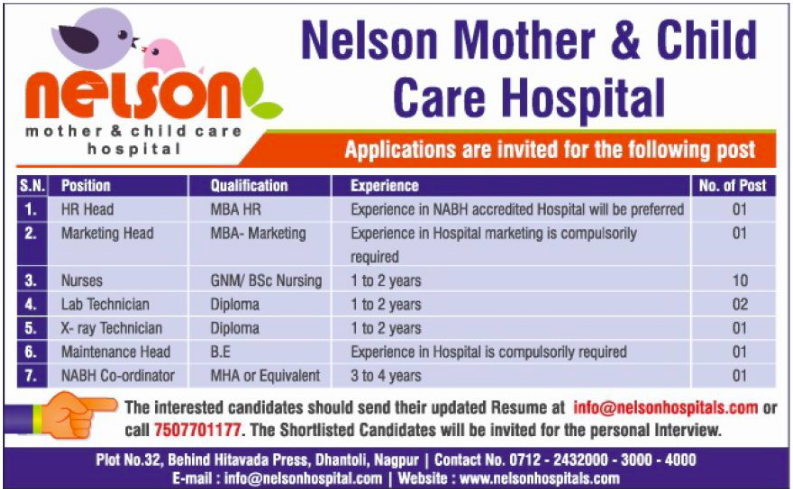 Interested & Eligible candidates can send their application along with all the necessary documents and testimonials email to info@nelsonhospitals.com. Application starts online 22-01-2019. Last Date of application is as soon as possible.